I had a rather lazy weekend, and to finish it off, I felt like making a lazy pasta dish. Spaghetti all carbonana is definitely one of these lazy dishes as it’s so easy to make, and only uses a couple of key ingredients. I’ve made this dish and eaten it a great number of times, but for Sunday night I decided to read up on how somebody else makes it, my favourite Chef Neil Perry. In his book The Food I Love, Perry gets it spot on when he says “A real carbonara doesn’t have cream in it. Why do so many make that mistake?” I’ve been brought up eating carbonara with just eggs and parmesan, so to me this really is the only way to eat it. So back to the recipe, I used a bit of inspiration from Neil Perry and a bit of my own knowledge to come up with the below recipe. I liked how his recipe used whole crushed cloves of garlic to infuse the butter and oil, but were removed before the pancetta was added. You end up with a subtle flavour of garlic which was nice. Also, the addition of wine was a new one for me, but again, this added a nice flavour the pasta. TIP: Carbonara is and always will be a fairly rich pasta, so it's nice to eat with a fresh green salad. In a pan, add the oil and butter and cook until melted. Add the crushed garlic cloves and continue cooking until golden. Remove the garlic for the pan and add the pancetta. 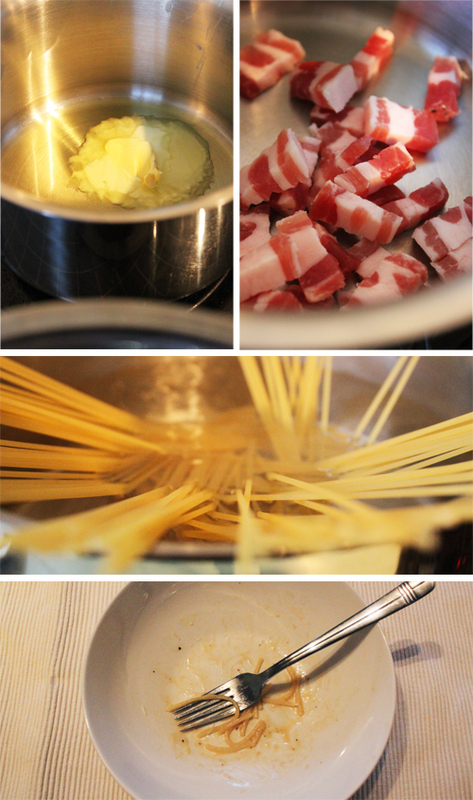 Continue cooking until the pancetta is crispy. Add the wine and cook until it reduces by half. Cook the spaghetti in a large pot of boiling water, until al dente. In a small bowl, lightly beat the egg, parmesan and salt and pepper. When the spaghetti is cooked, drain, and return to the pot. Add the egg mixture and quickly toss together, making sure all the pasta is coated with the egg. Add the pancetta and continue mixing. Serve immediately with a little extra parmesan. 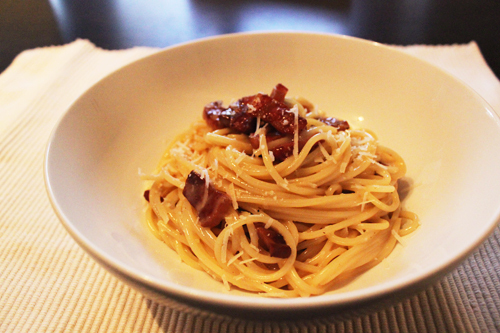 Carbonara is something you can only indulge in every so often. But when you do what a great treat it is. Nice recipe.